Catching a mouse is a tricky business because there are many things you need to keep in mind. 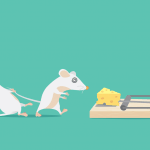 Before even setting out to buy a mouse trap or looking up how to set a mousetrap, you should make sure you even have mice. Since these animals prefer to stay hidden and are usually active only during the night, when you’re asleep, it’s unlikely that you’ll actually see one in your home. That is unless you’re really lucky.Otherwise, how do you know you’ve got a mouse or even mice? Well, you’ll notice mouse droppings around the house, and the packages where you keep your food will be slightly chewed. What’s more, if you’re suspecting you have a mouse in your home, check all the wires and other similar construction. Mice tend to chew through all of these. If any or all of these signs are present, you can be sure you’ve got an invader in your home.Now we can start researching traps. Some people argue that humane traps are better because there’s no real reason to kill the mouse, as it just stumbled onto your home by accident, but the thing is, these animals tend to destroy a lot of things and can spread disease. There’s an off chance that they can even return to your home after you’ve set them free. On the other hand, humane traps are better to have if you’ve got multiple mice as there will be no smell of death for them to run away from. Maybe a further explanation is in order. See, mice are animals which have a heightened sense of smell. This means that they will be able to smell a mouse which has died in your trap even if you throw him out. Since humane traps don’t kill mice, the problem doesn’t exist. But if you check your traps often enough and dispose of the dead mouse right away, then you can avoid this problem entirely. While on the topic of smell, there’s another very important point we have to cover.Baiting is an essential part of setting the trap, and you have to know how to bait a mouse trap in the right way so as to avoid mishaps and have a successful hunt. That’s why you need to remember this heightened sense of smell. 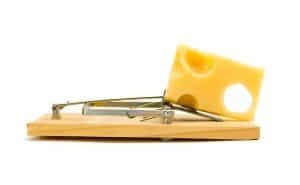 If you just take the bait with your fingers and put it on the trap, the mice will smell the human scent and stay clear of the trap. Instead of this, you should use vinyl or rubber gloves. This will ensure that no scent is transferred onto the trap. On top of that, remember that there’s a limit on how much bait you should put on the trap. If you put too little, the mouse won’t be compelled to enter the trap and take it. On the other hand, if you put too much, the bait can end up triggering the trap by itself, and then you have no bait, no trap, and no mouse. To ensure you successfully lure a mouse, you should only put around a tea spoon of bait.If you’re wondering what kind of bait you should use, it’s best if you get something full of high protein and something which has a strong smell. Such foods are cheese, chocolate or hazelnuts. It’s advisable to use peanut butter as it is the only type of bait which will stay where you put it. There’s no risk of it rolling or falling away and triggering the trap. Another important thing you should take into account is trap placement. This means that you can’t put a trap anywhere and expect positive results. The thing is, mice are small animals which build nests and hide in them. They will build a nest somewhere dark and warm, away from prying eyes. Furthermore, they won’t have the need to leave the nest often. They’ll only do it overnight when they’re getting food or exploring. And on top of that, they only move in around a hundred feet radius. So if you’ve noticed the droppings and chewed wires in a certain room, the chances are high that the mice are in that same room. You shouldn’t start small, either. 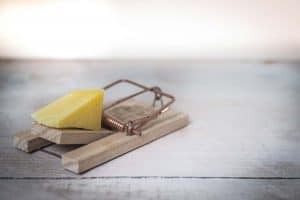 Most people think that a few traps are enough to get you started and to successfully trap the mouse, but in fact, the more traps you set on the first night, the better. You should put them a few feet away from each other to enhance your chances of success. Also, remember to put your traps next to the wall. They’ll have almost no effect if they’re put in the middle of the room. Mice don’t feel safe traveling so openly, so they will most likely pass by next to the wall. And therefore, that’s where you’ll get them. No one likes feeling exposed in a territory they know their enemy lives. Finally, there is one step that you can’t skip after you catch all of the mice in your home. First of all, you have to make sure that you really have no mice left. You can do that by paying close attention to any left droppings around the house or chewed food and wires. If none of these signs are present a few days after the last mouse has been caught, it’s safe to say that you do not have any more mice. Then, it’s time for the final step. Of course, we’re talking about cleaning. A house which has not been cleaned after all the mice are gone is a house begging for more mice to come back. Remember how we said that mice have a heightened sense of smell? Well, this is exactly what lets passing mice know that your house is nice and safe and perfect for them to inhabit. You should thoroughly clean every inch of the house so mice don’t keep coming back. There are many types of mouse traps you can opt for, all depending on your preference and goal. 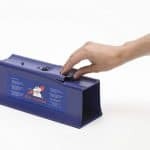 If you’re aiming to kill the mouse, then you can choose between electronic traps, glue traps, wooden or snap traps, rat traps, or even multi catch traps. All of these are useful in their own way. Glue traps are great for those pesky mice which seem too smart for any other traps because they are likely to step on the glue without noticing it. These should be kept out of the reach of children, though. Then we have electronic mouse traps which offer the safest experience and are best for those people who are afraid of mice or don’t want to handle dead mice. All you have to do is bait this trap and turn it on. It has a handy green indicator light which lets you know everything is set up properly. The mouse enters the trap through a little whole and it doesn’t escape it anymore. To get rid of the now dead mouse, you can simply open the lid and empty the trap into the trash can. Multi catch traps are perfect if you have many mice which you’d like to catch at once. This trap looks like a bigger box and can fit up to 15 mice. You can put a glue floorboard in it, or you can use it as a live trap and just bait mice inside. If you want to catch a mouse without killing it, you can use humane traps. These aren’t for those who are afraid of mice and who wouldn’t be able to do a good job of releasing the mice after they catch them. The essential part of a successful mouse hunt when using this trap is releasing the mouse on the right territory. This territory needs to be far away from your home so they won’t return anymore. You can either make a mouse trap or buy some humane traps from your local store. The ones you make at home are rather simple and require only an ounce of time. The simplest and most effective trap which you can make with a bucket and a toilet paper tube. You just balance the tube on the table and bait the part of it which is hanging above the bucket. The mouse will smell the bait and enter the tube, then collapse into the bucket with it. If you want to buy a humane trap, you can opt for the AB Pro-Quality which is a cage which operates on the premise of plates being triggered by the mouse’s weight when it enters the cage. 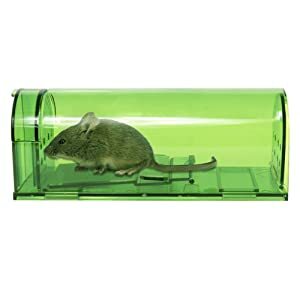 This is by far the most effective humane trap you can buy because the mouse will have enough room to move around and enough air to stay alive until you get to it. Wooden traps are more commonly known as snap traps because they snap and kill the mouse. They’re fairly easy to set. All you have to do remove the clip which is holding the kill bar securely. You’ll notice the arm bar now. It should be moved over the back of the trap, so it hangs. When you’ve done this, you can put the bait down safely. Remember everything that I mentioned about the bait and apply those steps. Once this step is over, you’ll need to pull back the kill bar. In order for it not to snap back, you’ll need to hold it with your thumb tightly. In order to secure the kill bar, you’ll need to latch the armbar under it. You can do this simply by putting the arm bar over the kill bar and latching it. What’s left is to put the trap next to the wall. Make sure that the baited part is closer to the wall because the mouse is more likely to take it, and be killed in the process. If you’ve been paying attention to the article, you’ll know what to do about proper trap placement. When you catch the culprit, you can either throw away the whole trap with the mouse still in it, or you can raise the kill bar and empty it into the trash can. Remember that patience is one of the most crucial factors of catching a mouse, as it can take up to a few days for your mouse to go after the bait. If more than 3 days pass, though, it’s a good idea to place the trap in a different place, as that will surely increase your chances. And that’s essentially how you build a mouse trap. Follow all the steps and instructions that have been set out in the above article, and you will be good to go with any and all mouse trap making endeavors. Good luck and go get that mouse!